To purchase tickets visit brownpapertickets.com or call 1-800-838-3006. Stoopdreamer. Photo by Marianne Driscoll. BOTTOM LINE: A nostalgic look at Brooklyn, set in Farrell’s Bar, a real-life Windsor Terrace staple that has served patrons since 1933. But while transformation is inevitable, the intentional destruction of a neighborhood is not, and Patrick Fenton’s Stoopdreamer addresses the wholesale disregard that renowned—if controversial—urban planner Robert Moses [1888-1981] displayed for the residents of Windsor Terrace, Brooklyn, when, in 1945, he announced plans to run a highway through this then-working-class community. 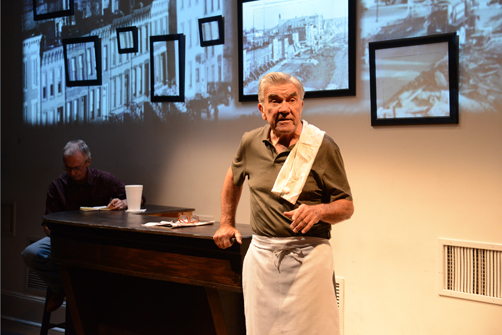 The play is set in Farrell’s Bar, a watering hole that has been in continuous operation for 82 years. Until the 1980s when “outsiders” began moving into the area, Farrell’s was the favorite drinking spot of the Irish immigrants who populated the district. Their kids and grandkids typically also became regulars—and were proud of maintaining a wide array of family and cultural traditions. That continuity is now gone, Jimmy the Bartender (played with gruff good-humor by Jack O’Connell) announces early in Stoopdreamer. He then reveals a bit of local lore, telling patrons of the bar—that is, the audience—that Farrell’s was one of the first saloons to open after Prohibition ended. “Something special happened here once, something that should be saved,” he begins. He then describes the moment when Robert Moses proposed construction of The Prospect Expressway, a roadway that now divides Windsor Terrace in two. Moses’ plan, Jimmy says, required the demolition of six blocks of factories, apartment buildings, single-family homes, and stores. As he recounts this turn, he sounds incredulous, as if this happened last month instead of 70 years ago. What’s more, he sounds heartbroken to report that despite tremendous local opposition, Moses’ plan went forward, displacing more than 1,200 people and leaving thousands jobless. “A vital part of the neighborhood was gone forever,” Jimmy shrugs. As he speaks, numerous archival photos of pre-Expressway Brooklyn are projected onto the wall behind him. Some are framed, literally surrounded by thick black lines which make them stand out. Unfortunately, these frames are never removed or dimmed, so that when gigantic images of the wrecking ball are later presented, the frames remain distractingly visible. Nonetheless, this optical annoyance does not take-away from the important lessons that Jimmy imparts. And it is not just Jimmy. Although he serves as the main documentarian, Jimmy’s look-back is supplemented by the reminiscences of two others: Billy Coffey (Bill Cwikowski) and Janice Joyce (Robin Leslie Brown), patrons having drinks, separately, at Farrell’s. Both regale the audience with anecdotes about long-gone characters, from pool hustlers to soap-dappled employees of the Brillo plant, from movie projectionists to ticket takers. They’re vivid stories. At the same time, because Billy, Jimmy, and Janice talk directly to the audience, rather than to each other, Stoopdreamer feels more like a series of short lectures than a play. Their nostalgic monologues are a heartfelt, albeit idealized, recitation of the tight-knit community’s many virtues, at least until Billy consumes enough liquid courage to reveal the underside of its insularity. “I wanted to be a writer,” Billy reveals. He was discouraged from doing so, he confides, told in no uncertain terms that in Windsor Terrace men become cops. ”Writers are the queers I arrest in the men’s room,” one local offered. Twenty years later, Billy is about to retire and pursue his passion, a stoopdream deferred. For her part, Janice is looking to reclaim the glory days of her youth while conjuring up the people and places that defined her past. Bars including Farrell’s, Lanihan’s, and The Hilltop Lounge, as well as Smith’s Funeral Home, the Globe and Sanders Theaters, and the Holy Name Catholic parish are called up. Although only Farrell’s and Holy Name Church have survived the “renewal” of recent decades, Jimmy, Billy, and Janice pay homage to the Windsor Terrace of yesteryear. They also throw a few poisoned darts at the gentrifiers who have moved into the community and question the ongoing development of Kings County. “Everything changes and nothing stands still,” Plato once cautioned. Patrick Fenton’s Stoopdreamer acknowledges this, at the same time asking us to remember, and perhaps defend, those who get trampled in the rush to questionable progress.